Accurate layout is essential for a tight-fitting tusk tenon. 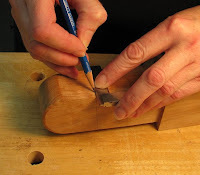 Start by drawing a line on all four sides of the tenon where it exits the legs. 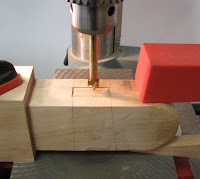 Next, trace the wedge's angle onto the tenon an d transfer this line the entire way around the tenon. 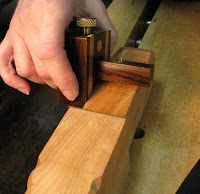 In so doing, you have a reference line with which line up the angle of your chisel as you chop the mortise. I used a mortising gauge to mark the long walls of the mortise, defined the shape with an exacto knife and chisel, removed some waste at the drill press, and cleaned up the mortise with chisels. In the second to last photo, you may notice that the wall of the mortise that is close st to the leg assembly is actually stepped back a bit. I did this for two reasons: I still have final planing to do on the legs (which will red uce their thickness slightly); and to ensure a tight fit. 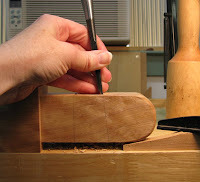 With the mortise embedded inside the legs, the wedge pushes against the part of the leg that is above and below the mortise. I don't know if this is normally how it's done since I've never seen a tusk tenon disassembled, but it worked, and that's good enough for me. One down, one to go! The carved design dresses up the wedge beautifully - wonderful touch! I particularly like the 'raised pinkie' whilst using the marking gauge. Very stylish. And Gary, thanks for pointing that out. Proper placement of the pinkie whilst using a marking gauge will be covered in a future post entitled "Woodworking Manners & Etiquette for the Discerning Craftsman." Having just seen Kung Fu Panda over the weekend, I now realize that you are practicing the Moo Shi Finger Hold. Apparently, if you flex your pinkie while performing this hold, you are apt to disintegrate the person or object you are holding. Please be more careful in the future when practicing Kung Fu Woodworking. Great post! You're right I don't think I have ever seen a tusk tenon disassembled and you did a great job of breaking this down. Your post takes me back, the first piece of woodwork I did, shortly after I became an apprentice, some 36 years ago. I built a small bench with a stretcher that was through tenoned with a wedge (tusk) tenon. I have done a few more since then, mostly on larger pieces, but nothing nice as this! 36 years?! Holy mackeral, you have two decades more experience than I have. Nice work VC. There's something very appealing about a joint where the mechanism is so clearly spelt out by the external form. And I love joints that work without glue. We had an exercise in my first year at art school where we all had to make a "fine furniture" hall table without using glue. There were many great solutions but the joints that physically lock were my favourites. 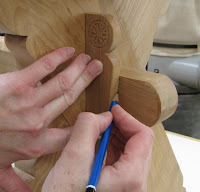 I agree with Al that the carving is a wonderful detail that adds to the overall design. I agree, Mark (woodfired). I love to see exposed joinery, and the exercise in your first year art school program sounds like a fun and exciting challenge. Funny you should bring it up. The one thing I like most about this project is that it completely knocks down except for the work surface and drawer. 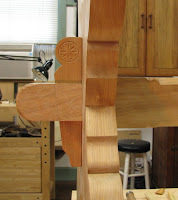 I was working on ways to make those two pieces either knock downable or jioned together w/o glue, and in the process, stumbled upon a joint in my Roman Woodworking book that might work. Or at least a hybrid of the joint. I just love the terminology of woodworking, as I've found it here. "Tusk tenon." It sounds like it should be an obscure subsection of ecclesiastical law, or an ornament for elephants. "Mom, can I get a tusk tenon? Madison's getting one. Pleeeease?" "Over my dead body, young lady!" OK, I'll stop now. You really shouldn't allow poets on this blog lol. Er, I meant, how interesting.